(Bloomberg Opinion) -- China’s banks may have a flood of bad loans waiting in the wings. Not that you’d know it from looking at official levels for 2018, which suggest the problem was broadly contained. The reality is that newly soured debt was coming through the front door as fast as banks could shovel it out the back. Authorities worked hard to restrain financial-system leverage in 2018. Outstanding credit increased a relatively modest 10 percent, with growth in new loans falling 14 percent. The government accomplished this primarily by tightening restrictions on shadow banking and moving that lending into the formal banking system, which recorded a 13 percent jump in new loans last year. To make way for that increase, and with new deposits falling 1 percent last year, banks sold a lot of nonperforming debt to asset management companies. Sales to AMCs and other disposals totaled almost 1.8 trillion yuan ($268 billion), according to a report by Jason Bedford, executive director of Asian financials research at UBS Group AG in Hong Kong. To put that in perspective, China began the year with 1.7 trillion yuan in bad loans and ended it with 2 trillion yuan. In other words, after selling roughly their entire declared stock of soured advances, lenders still closed the year with more than they started with. 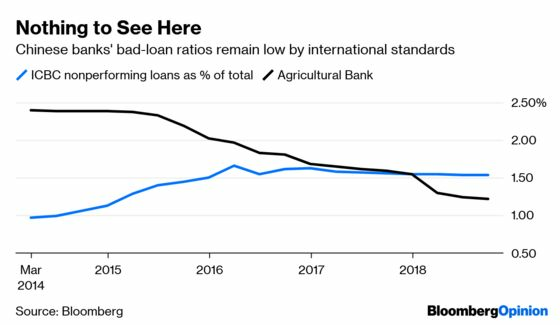 Second, the figures imply that China has barely begun to scratch the surface of its bad-loan difficulties. Reported nonperforming debt ratios are low: ICBC’s was 1.53 percent at the end of September, down from 1.56 percent a year earlier. But there has long been speculation about how accurate these numbers are. Chinese bank IPO prospectuses hint at liberal definitions for bad debt. Third, the financial sector is becoming increasingly capital-constrained. Banks will find it harder to raise funds without significant public intervention. The AMCs, also known as bad banks, will also need more capital, as Bedford notes, and there’s no plan to deal with the smaller and mid-size lenders, which are the most in need of extra capital. The major state-owned lenders have already started rolling out recapitalization offerings. In January, Bank of China Ltd. became the first to sell perpetual bonds, raising 40 billion yuan. China Citic Bank Corp. also plans to sell the debt, which counts toward tier-1 capital. These issues may require backstopping by the People’s Bank of China to succeed. The central bank last month swapped 1.5 billion yuan of its one-year bills for perpetual bonds, the first use of a new tool aimed at increasing market acceptance of the securities and encouraging commercial lenders to sell more. Expect more such swaps to be announced. The situation won’t inspire confidence among foreign banks that are kicking the tires of smaller local lenders they may use to enter the Chinese market. China urgently needs full and transparent disclosure of the size of its bad-debt problem, and a clear plan to address it. The longer it delays, the more expensive and painful the fix will be. Christopher Balding is a former associate professor of business and economics at the HSBC Business School in Shenzhen and author of "Sovereign Wealth Funds: The New Intersection of Money and Power."